This safari tour is an ideal option for travellers on a tight time schedule who want to experience the wonders of South Africa’s iconic national park and its incredible animals and birds, including the famous Big 5. Guests stay in spacious 2-man Meru safari tents that are equipped for comfort and convenience. Dining under the stars around a camping firepit makes it an authentic safari experience. The Kruger Park is renowned for its incredible biodiversity and rich cultural history. This tour offers you a brief glimpse of an outstanding wilderness region that falls within the internationally-declared Kruger2Canyons UNESCO Man and Biosphere. 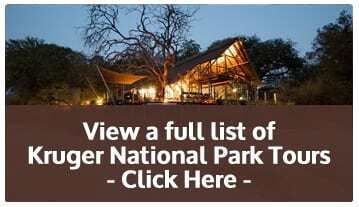 Kruger National Park open vehicle safari tour; sunrise and sunset game drives. Guests stay in safari tents in the camping section of Pretoriuskop Rest Camp in southern Kruger National Park. Shared ablution facilities are clean and located close to the tents. A special feature of the historic rest camp is an enormous swimming pool built around a massive granite rock. It’s the best swimming pool in the Kruger Park. Settle into your safari tent at Pretoriuskop and freshen up. Depart for a late-afternoon game drive in a SANParks open safari vehicle with a Kruger Park ranger. They’re allowed to take guests out for night drives and return to Pretoriuskop after normal gate closing times. Guests are collected and dropped off at OR Tambo International Airport in Johannesburg. By special arrangement, guests can be collected from hotels or guest lodges in Johannesburg or Pretoria for an additional cost. Guests can also be collected and dropped off at Kruger Mpumalanga International Airport on the outskirts of Nelspruit. We can accommodate alternative times and/or late arrivals for an additional cost. If you want to fly out of Nelspruit and not travel all the way back to Johannesburg with us, we can drop you off at the airport between 12h30 and 13h30. For transfers out of these scheduled times, consult with your booking agent. Extra charges may apply. If you plan to fly out of OR Tambo International Airport on the last day of the safari tour, we suggest reserving a domestic flight that departs no earlier than 19h30 and an international flight that departs no earlier than 21h00. For overnight accommodation close to OR Tambo International Airport, we recommend Saba Lodge. The lodge is owned and operated by Moafrika Tours and complimentary transfers to/from the airport and Saba Lodge are available on request.